The 2016 Gurlie Locks Calendar was hit! The Calendar features Miss Julie Zamor as our Cover Girl. We still have a few calendars left so get one while they are still available. In addition to our Calendar Girls, we added 8 pages of collage pics as we tried to include as many pics of our clients, birthday parties, Girl Scout tours, Wigs for Kids donors and other events as possible. If we missed you, we apologize but we had a lot of girls to fit in. You can your calendar now and stop by our shop to pick it up or you can choose to have it mailed out. The 2016 Gurlie Locks Calendar features Miss Julie Zamor as our Cover Girl. Each month is represented by one of our beautiful Gurlie Lock Calendar Girls. There are hundreds of other pics featuring clients, birthday parties, Wigs for Kids donations, Girl Scout Fun Patch Tours and much more. 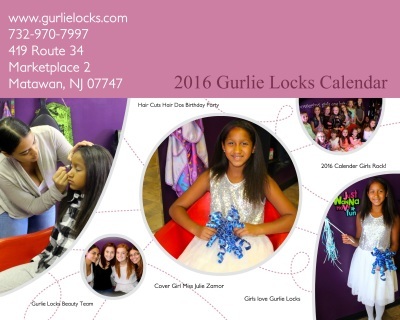 Our Calendar is sponsored by Dresses & More, Marketplace 2, 419 Route 34, Matawan, NJ 07747. Stop by for Communion Dresses, Tween and Teen Party Dresses, Women's dresses in all sizes.